Week 91 Menu and Happy 4th of July! Happy Independence Day! 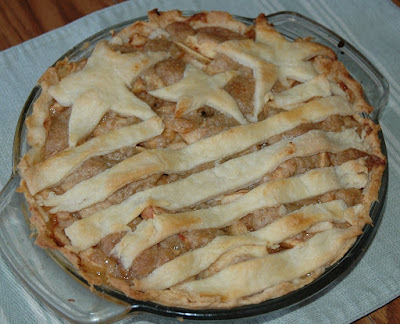 We celebrated the 4th of July yesterday a little, but today I thought I'd make some apple pie. What's more American than an apple pie? I tried this recipe from the Sister's Cafe. We've been talking as a family about what that means to live in a free country. Two of my husband's brothers have recently served in the army and were deployed in Iraq for a while. After seeing the sacrifices that they made to go to Iraq and how it affected their families I have a deepened appreciation for those that serve to keep our country free. I got a little choked up today at church watching a guy wearing his army uniform a few rows up while we were singing The Star Spangled Banner. That being said, time for my menu. It'll be a busy week with swimming lessons and soccer camp every day. And my baby is turning one this week! Well, that's my menu. What's on your menu this week?